When we were little, my brothers and I committed an endless stream of wrongs against one another. Once we'd been caught by the folks, each of us was directed to apologize to the victim of the teasing, the ostracizing, the exclusion, the punching, the ditching, or the name calling. Those apologies were never sincere. We were unrepentant and eager to get on with our games. "I'm sorry I abandoned you while we were playing hide and seek." "I'm sorry I accidentally made your lip bleed when we were wrestling." "I'm sorry that I pedaled really fast and left you to bike to school alone." Our parents knew we were insincere, too, but they orchestrated the whole ceremony of acknowledgment and apology anyway. What's more, they orchestrated the ultimate act of forgiveness. This last part was equally insincere, but even more important than the apology itself. It was the act of repenting and the act of forgiving which my parents wanted to instill in us. They couldn't force us to be sorry for something, but they could teach the difference between right and wrong and then take us through the paces of apology and forgiveness. Eventually, we began to apologize for stuff on our own, too. Wonder of wonders! We processed the situations and empathized with our victims and then, urged by something akin to the Golden Rule, we attempted to repair the damage with words. Even at times when we didn't feel regret or guilt, seeing the sorrowful look on our sibling's face was enough to squeeze the apology out of us. And in the end we learned something, garnered trust, improved our relationships. Apologizing made a difference, even when the motivation wasn't sincere. When the United States government has apologized for past wrongdoing, as in the case of paying recompense to the descendents of slaves or to the Pilipino veterans who fought alongside our troops in the WWII Pacific Theater, I know people who have bristled at the whole transaction. These people are indignant at being a reluctant party to an apology for something they, individually, did not do. "I never owned a slave!" They cry, hopping up and down. "I wasn't born until after the second world war!" These people are indignant at the prospect of extending an apology to people who aren't direct victims. "What do these people deserve money for?! Why do they need an apology?" They cry, wringing their hands and snorting with rage. "They were never sold by anyone! They are American citizens who can vote and attend schools, and they've never been denied those rights!" The American government has been standing for more than two hundred years, and in that time, countless atrocities have taken place on our soil, have been waged by the very people we trusted in positions of authority. Whole races of people were dislodged from their homes, places where their ancestors lived for thousands of years, and were pushed back into less desirable territory or rounded up and made to live within the confines of reservations. Hundreds of thousands of people were sold on auction blocks like livestock, were disenfranchised, were denied education, and were refused the most basic rights of privacy and family. And then those people were worked to death in plantation fields and wealthy households alike. Peoples who were our allies in times of war, and who were promised compensation by our government as a token of our gratitude, were cast off once the war was over and our country no longer needed them. Agreements were broken. Promises became lies. Must I apologize for any of this? No. I committed none of it. And had the decision been left up to me, I like to believe that I would have discerned swiftly the difference between right and wrong, and then would have leveled my judgment on the side of right. But nobody asked for my opinion. I wasn't around for any of the aforementioned transgressions. SHOULD we apologize for any of this? Yes. I commend the people who lobbied for these apologies. You see, whether or not we as individuals were involved in these issues, it is the fact that our country still stands in spite of our sins which makes us especially prideful. And it is that pride which must be cast off in order to make us a stronger nation. 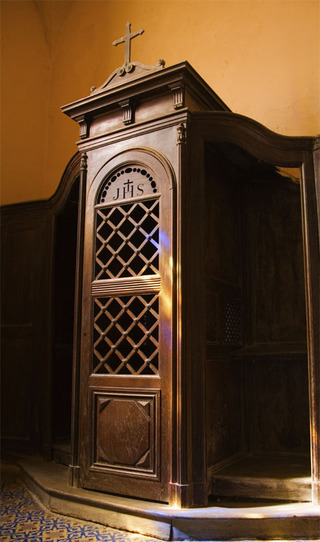 I was reading Don Miller's Blue Like Jazz , and he tells the story of constructing a Confession Booth on his super liberal college campus during a particular party week, and then waiting for people to come to the confessional. Once a person entered the booth however, he or she discovered that the Christians who built the booth were not expecting their fellow students to admit their sins and repent of all wrongdoing, all drunken debauchery, all sins, all transgressions, but rather that the Christians themselves were the ones doing the confessing. Miller confessed his personal shortcomings as a Christian and as a human being, and he then apologized for the Crusades, and for Columbus, and for the missionaries who moved North from Mexico and slaughtered Mexican and American Indians in the name of God. Miller apologized for the televangelists, and for Bill Clinton and for every other politician who has claimed to be a Christian before acting in a way out of line with Christ's teachings. And then he was grateful when the man sitting across from him, a man who was not a Christian and had actually come to deride whatever group had constructed the ridiculous confessional, offered his forgiveness. Between those two individual men, there was really nothing to apologize for, and nothing to forgive in return. They didn't know one another and had not wronged one another. But the act of apologizing, first acknowledging all of the terrible things done by Christians in the past and then asking, in all humility, for forgiveness, was startlingly productive in spite of those facts. Apologies require humility; they require us to roll over and expose our vulnerabilities to someone who may or may not deserve the right to gut us outright rather than sparing our lives and our dignities. The majority of the time, though, everyone walks away from an apology feeling better. In Don Miller's case, his choice to be open and humble with a fellow student allowed that student a chance to see that some Christians take Christ's edicts about love very seriously. Some of us do believe that love IS the great commission. And in humbling himself before a stranger and following that commission, Miller's walk with God was infused with strength and peace. In the case of our government, it had a black eye. It had maintained that black eye since its foundation, an injury acquired by allowing slavery, by allowing the uprooting and slaughtering of Indian tribes, by backing out on deals made with foreign governments when those agreements were no longer convenient for us. We ignored that black eye... and that's the trouble with a black eye, don't you think? You can't see it without using a mirror, but it's the only injury you cannot hide when you're face to face with anyone else. So, when our current government representatives apologized for those trespasses of ages past, it was like balm for the black eye. Those who had been nagging us for that apology for ages were placated and stopped asking. And our concession, allowing that we, the most powerful, the richest, the most democratic nation the world, DO make mistakes, ended up being a positive step forward. Campaign for Japanese Government Apology to "Comfort Women"